The country’s ceremonious administrative centre is also a moving and historically charged area. Emerging from Universidad de Chile Metro station, you’ll immediately get an idea of where you are standing. This is the Alameda, Santiago’s grand – if somewhat overwhelming – main avenue. The boulevard styled section of what is otherwise Santiago’s axis, runs through what used to be a tributary of the River Mapocho, later developed into a serene tree-lined thoroughfare baptised as Alameda de las Delicias. The modern day Alameda is hardly tree-lined or delightful, but remains strategic as the south end of Santiago’s centro histórico, whilst the River marks the north end. The east and west boundaries are somewhat vaguer; most sources will recall the original city limits of the Cerro Santa Lucía to the east and Avenida Brasil to the west. These days, however, the western boundary is widely accepted to be the notorious section of the Norte-Sur highway, whereas Plaza Italia is increasingly considered as being the eastern gateway to the city centre even if it’s quite distant from the actual historic quarter. The gig line-up: La Moneda’s Changing of the Guard draws large audiences. Kick off by walking down elegant Calle de Nueva York, where you’ll be met by one of Santiago’s richest collection of neo-classical palaces. Facing the Alameda, the Club de la Unión is a beautiful example of how Chile’s first economic miracle in the early 1900s changed the face of colonial Santiago. Other remarkable buildings include the Bolsa de Comercio (Stock Exchange) with its line up of handsome, wooden shopfronts, and the former Hotel Mundial on the opposite side. Venture down Calle Moneda towards the neat and geometrical Plaza de la Constitución. At the corner of Calle Morandé and Moneda lies the sombre looking Ministry of Justice, once the headquarters of the Ministry of Social Security and site of one of the most notorious and obscure episodes of Chilean Republican history. On 5 September 1938, some 60 young men who plotted against the government of Arturo Alessandri were brutally massacred inside this building after their revolt was quashed. It is believed that Allesandri, who was in charge of the operation, odered police to fire agains the young men, even if these had offered little resistance once the plot had been foiled. But the history surrounding the Barrio Cívico has darker stories to tell. The area’s centrepiece, the Palacio de La Moneda is quite possibly Santiago’s most recognisable landmark. 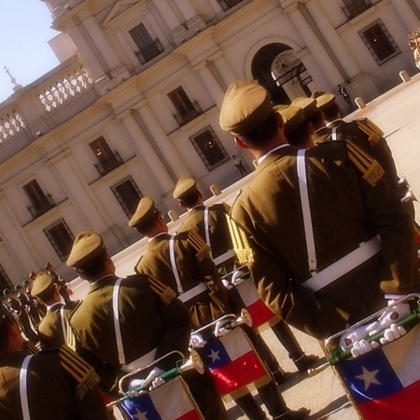 For several generations of Chileans, the images of La Moneda being blitzed under orders of General Pinochet in 1973 marked the beginning of a divisive period in the history of Chile. (See inset) These days, however, the impeccably restored palace has regained its status as a symbol not only of Chilean democracy but of nationhood itself. Yet it’s not only its sentimental value which makes this building remarkable; la Moneda is an imposing, elegant palace and one of the finest examples of late 18th century colonial architecture. Its construction began in 1784 – according to the project by architect Gioacchino Toesca – to house the national mint, hence its name (moneda is Spanish for coin). In 1846, some three decades after the Chilean independence wars, the building was destined to be the seat of the republican government. The north access to the palace – opposite Plaza de la Constitución – is garded by the famous Palace Guard, who offer a crowd-pleasing Changing of the Guard ceremony every other day at 10 am (See Schedule). It’s well worth venturing into the palace’s inner courtyards: working your way south, you first come across the Patio de los Cañones, with reference to the two 18th century cannons. This courtyard leads onto the Patio de los Naranjos, where orange trees surround a beautiful 17th century fountain that originally stood at the Plaza de Armas. Most people ignore the existence of two other courtyards, Patios del Canelo and de las Camelias since they are normally closed to the public. Most of the palace is, however, open to the public – the sign of a unique civic tradition in Chile. For years, presidents used to walk in and out La Moneda unescorted and still today security remains relatively lax, nevertheless, you may be barred from accessing certain parts of the building if special activities are taking place. Outside the south entrance of the palace, you’ll stumble upon the re-baptised Plaza de la Ciudadanía (the former Plaza de la Libertad which was, in reality, little more than a car park). The remodelled plaza is part of a scheme to build an underpass for the Alameda, creating an esplanade that connects to Paseo Bulnes. This is in fact the revival of an earlier project for the Barrio Cívico, and though target dates are somewhat unclear, it is expected to be completed by 2010. An important element of the project was the creation of the Centro Cultural Palacio de La Moneda, which opened in 2006 in the Palace’s basement. There is speculation that this used to be a Hitler-style underground bunker built by General Pinochet; the official version, however, tells you that the basement predates Pinochet and that a great deal of effort went into its redesign. For what it’s worth, the Centro Cultural La Moneda is a thriving art space and exhibition centre, and its sheer size and cutting-edge feel make it also one of Santiago’s finest. It boasts several exhibition halls, a cinema, a media library, a café, restaurant and shops. Don’t miss out on some of its superb exhibitions showcasing some of the best examples of traditional and contemporary Chilean art. Moving away from La Moneda, head north via Calle Morandé, right into the heart of Santiago’s officialdom. As you reach Calle Compañía, you’ll find the Tribunales de Justicia, housing the not very popular Supreme Court. It’s got an acidic and lugubrious look, though it is nonetheless a well achieved neo-classical building that oozes formality. Take your time to check the hit and misses of the surrounding architecture; many buildings have rightly deserved a revamp, like the ex-Congreso Nacional (Former Seat of Parliament), with its pantheon-style columns and lush public gardens. Others have been notoriously neglected, and some of the worst casualties of deranged urban planning can be appreciated from this point to the north. 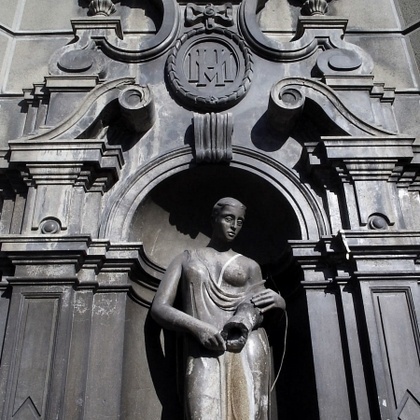 For a more uplifting sight though, walk east to find the Palacio de la Real Aduana and its Museo de Arte Precolombino, one of Santiago’s cultural treasures. Definitely add this one to your must-see list. The museum boasts an impressive collection of archaeological objects covering every pre-Columbian civilization from A to Z, plus a series of annual exhibitions that are certainly worth exploring. The museum has a research centre, a specialised library, a café and a well-stocked bookshop.